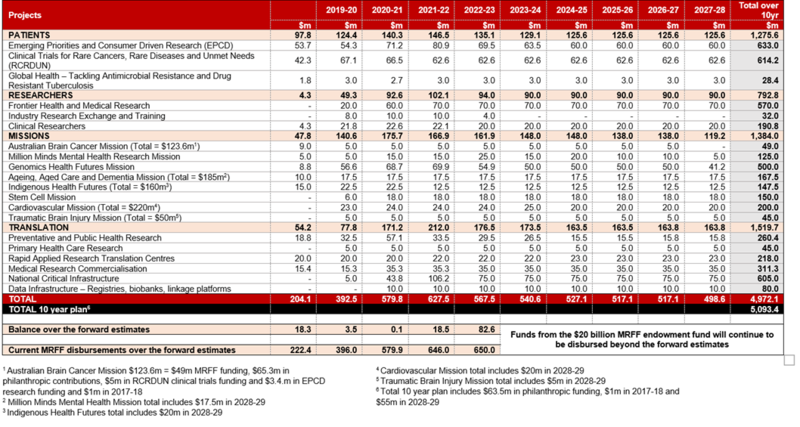 2019-20 Federal Budget – what’s in it for medical research? The news this week has been dominated by the release of the 2019-20 Federal Budget. We have created an analysis of the budget and extracted all pertinent information related to the medical research sector, which you can find on our website. The big news was the continued commitment to fully funding the MRFF by 2020-21, and the publication of a 10-year investment plan, which you can read about in our media release: AAMRI welcomes Government’s $20 billion commitment to medical research. In preparation for the upcoming Federal Election in May, late last month we distributed out Election Statement outlining three key areas any future government needs to focus on. Thank you to all our Members who helped spread the word by sharing our media release, the animation (see below) and Election Statement. We were also pleased to have an op-ed published in The Australian, ‘Memo to Canberra: hands off the $20bn research fund‘ authored by AAMRI President Professor Vlado Perkovic. We will continue campaigning on behalf of the sector and keep you posted on key announcements. 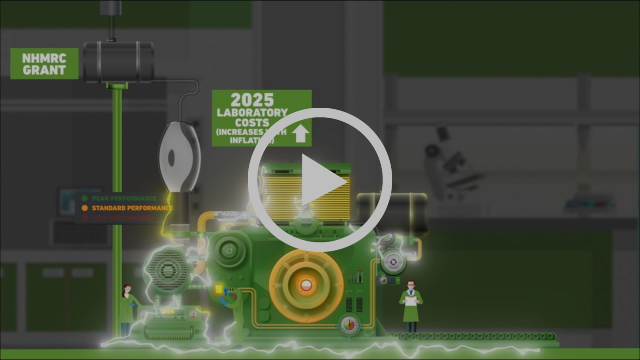 Watch AAMRI’s Election Statement Animation – highlighting the importance of a fully funded MRFF along with other key priorities. The 2019 AAMRI Convention will take place on 27 and 28 November 2019 at the Hyatt Hotel Canberra. Please save the date for your diary and we look forward to seeing you there. This month the HRI celebrated 30 years since it opened its doors. Today, the HRI features over 180 personnel who are dedicated to finding solutions to Australia’s (and the world’s) number one killer – cardiovascular disease. AAMRI operates a variety of member networks in key business areas that discuss issues, share ideas and network at an annual event. AAMRI’s staff networks connect professional staff at AAMRI member institutes with their counterparts to discuss common challenges and issues facing the medical research sector. There are currently five active AAMRI staff networks – HR, IT, Research Governance, Research Strategy and Research Administration Officers (RAO). For information on AAMRI Networks, upcoming network events and how to join, visit the AAMRI website. The Royal Commission into Victoria’s Mental Health System will hold a series of community consultations across the state beginning this month, encouraging people with mental illness and their carers to have their voices heard. The Royal Commission’s first community consultation will be in Whittlesea on 5 April, and consultations will continue through May. Other consultations will be held in Pakenham (9 April) and Hamilton (11-12 April). To register for upcoming consultation sessions visit: https://rcvmhs.vic.gov.au/. The Productivity Commission is undertaking an inquiry into the social and economic benefits of improving mental health. Initial comments on the Issues Paper are due by 5 April 2019. The Review of the Clinical Governance of Public Mental Health Services in WA is currently being undertaken by an independent Panel. The Panel is inviting clinicians, consumers and carers, organisations and service providers to share their experiences. The Australian Government endorsed a program of reform to further strengthen the regulation of medicines and medical devices in Australia. As part of the Australian Government Department of Health, the Therapeutic Goods Administration (TGA) regulates these products, and is responsible for implementing the Government’s reforms. The following consultation and the TGA invites comments, all close on April 29, 2019. The ARC is examining it’s implementation of the National Science and Research Priorities and associated Practical Research Challenges under the National Competitive Grants Program. It has published a brief Discussion Paper setting out the scope of the review, and providing a number of questions to guide discussion. Submissions are now open and will close at 11.59pm on Thursday, 16 May 2019. The Australian Research Council, Australian Bureau of Statistics, Statistics New Zealand, and the New Zealand Ministry of Business, Innovation and Employment are undertaking a joint review of the Australian and New Zealand Standard Research Classification (ANZSRC). Public consultation for the ANZSRC Review is now open. Submissions close on 7 June 2019. Announced as a measure within the 2018/19 Federal Budget, the independent review will give consideration to the attraction into nursing as a career, international competitiveness of Australian based education programs and articulation and career paths of the preparation programs for enrolled and registered nurses and nurse practitioners. Closes 21 June 2019. The Royal Commission into Aged Care Quality and Safety invites interested members of the public and institutions to make submissions to the Royal Commission. The Royal Commission will continue to accept submissions until at least the end of September 2019. Senator Kim Carr has set out further details on a Labor Government’s priorities for industry, innovation, science and research in a recent speech to Universities Australia. In the speech he spoke about the root and branch review of the research system which Bill Shorten announced last year and is being headed by former Chief Scientist, Prof Ian Chubb AC. Senator Carr said he expected the review to help guide Labor in the decisions that must be made about possible restructuring of funding mechanisms, and also said it was important to know what difference the Medical Research Future Fund is making. This survey is part of a PhD project for Kate Christian, who is a research student at Federation University Australia and is conducting a research project exploring challenges faced by early-career researchers in the sciences in Australia. It is expected that the results will inform recommendations for changes to the work environment for these researchers in order to increase their job satisfaction and the likelihood of them continuing to work in research in Australia. The online questionnaire is completely anonymous, and will take approximately 20-25 minutes to complete. To participate in the study please visit this link. See our MRFF section below for details on recent MRFF funding announcements. $105 million co-investment from the Commonwealth Government to establish the Peter Mac Centre of Excellence in Cellular Immunotherapy. $24.6 million for Australian clinical trials hub at the Alfred to focus on regional cancer trials. $10 million for dementia centre of excellence to be established at Curtin University in WA. Three new treatments – one for cystic fibrosis, the second offering relief for women who have survived cancer, and the third to treat fibrosis – have been selected for commercial development assistance through the $500 million Biomedical Translation Fund. $7 million to Mindgardens Neuroscience Network for research aimed at developing improved models of care for people living with brain disorders. $6 million of funding for Cabrini Health to establish a new Institute of Cancer at its Malvern site. $3.4 million to improve STEM equity in Australia and boost the participation of girls and women in STEM careers. $3 million research funding for Chronic Fatigue Syndrome. Each year, the NHMRC recognises excellence in the health and medical research sector by celebrating individual achievements, leadership and the exceptional contributions of Australian researchers to their fields of research. Congratulations to all recepients, it was fantastic to see so many of our member’s receive recognition, you can view the full list here. This funding scheme provides funding and support to create new opportunities for researchers and policy makers to work together to define research questions, undertake research, interpret the findings and implement the findings into policy and practice. It has a continuous application process. More details of the NHMRC website. The NHMRC e-ASIA Joint Research Program scheme (NHMRC-e-ASIA JRP scheme) will support Australian participation and collaboration in leading international collaborative research through the e-ASIA Joint Research Program. Application close 14 May 2019. The aims of this call are to increase understanding of the acute and long term potential human health effects from exposure to PFAS chemicals and to inform appropriate responses to managing or reducing human exposure to PFAS. Minimum data closes 5pm (AEST) 17 April 2019, closes 01 May 2019. All MRFF funding opportunities are advertised through GrantConnect. Make sure you register so you receive the latest funding updates. At the Budget a 10-year MRFF funding plan was announced, detailing the amount of funding to be directed each year to the different missions and other initiatives. Click on the table below to view the full image and see what’s planned for the long-term. There’s been a steady stream of MRFF funding announcements over the last month. We’ve made a handy table to help you keep track of what funding schemes are open and where to go for further information. This grant will aim to address questions that focus on comparative effectiveness of health services and areas of health system practice with low or insubstantial evidence and gaps in knowledge and evidence relating to health system problems important to the public, providing opportunities to explore consumer-driven research. Closes 5pm ACT local time 10 April 2019. The new Genomics Health Futures Mission (GHFM) is now open for Australian researchers. Grants are $100k to $5 million over three years. This grant opportunity is the first round of the Projects Grant and the Ethical, Legal and Social Issues Research Grant streams. Closes 5pm ACT local time, 31 May, 2019. The $106 million Flagships stream forms part of the GHFM and will be delivered over nine years from 2019-20 to 2027-28 through a number of rounds. This grant opportunity is the first round of the Flagships stream. Grants range from $1-10 million for a maximum length of four years. Closes 5pm ACT local time, 11 July 2019. The Program forms an important component of the National Blood Authority’s (NBA) blood sector research and development framework and aims to facilitate world-class research and development in Australia that contributes to optimising the use, management and administration of blood products, and improve patient outcomes. Closes 11:30pm ACT local time, 05 April 2019. The EMCR mobility grants are intended to strengthen international research networks and linkages by providing support (up to A$5000) for Australian researchers to travel to France or Europe and work with leading researchers at major science and technology organisations for a period of between 14 and 28 days. Closes 9am AEST, 08 April 2019. Supported by the MRFF, the objective of the fund is to strategically fund research and adresss national priorities in a cohesive and coordinated way. Closes 5pm, 09 April 2019. The Bionics Institute award for excellence in medical device innovation acknowledges an individual who, through their innovation and/or inventiveness, has made a significant contribution to the development of a medical device, particularly one which has been successfully commercialised. The successful candidate will be awarded $5000 in prize money and subsequent media attention including a 90 second video to be shown on the evening of the Graeme Clark Oration (22nd July 2019). Nominations are open and close 5pm AEST on 30 April 2019. The PdCCRS is Cancer Australia’s innovative annual national research project grants funding scheme which brings together government and other funders to collaboratively fund cancer research in identified priority areas in Australia. Experienced investigators as well as Early Career Researchers with less than 7 years post-PhD or post-MBBS are eligible to apply. Closes 5pm ACT local time 15 May, 2019. YSEP funds an annual exchange of Australian and Chinese early to mid-career researchers in the fields of science, technology and medicine. It is open to researchers in academia / research institutes and to researchers in business / industry. Australian participants travel to China during 28 October-9 November 2019. Participants’ travel, accommodation and associated living costs will be covered by the program. Details will be available on the Applied website from Monday, 08 April. Closes 9am (AEST) 20 May, 2019. Nominations and applications are open for the 2020 Australian Academy of Science awards. Central to the purpose of the Academy is the recognition and support of outstanding contributions to the advancement of science. Closing date for honorific award nominations – 1 May 2019. Closing date for research conference and lecture funding, research awards and travelling fellowships – 01 June 2019. As the national peak body for health and medical research, these prestigious awards are the celebration of the outstanding efforts and achievements of individuals and teams who drive and support the opportunities that health and medical innovation bring to each and every one of our lives. Visit their website for a full list of categories. Nominations close COB Friday, 05 July 2019. Women & Leadership Australia is administering a national initiative to support the development of female leaders across Australia’s health sector. The initiative is providing women with grants of between $3,000 – $7,000 to enable participation in a range of leadership development programs. The scholarship funding is provided with the specific intent of providing powerful and effective development opportunities for health sector women; however the funding is strictly limited and has to be allocated prior to the end of this financial year. Find out more and register your interest by completing the Expression of Interest form here prior to 07 June 2019. The Australian-American Fulbright Commission will double the number of scholarships on offer this year, via a new program of scholarships funded through a generous private donation. Australian medical researchers, scientists and practitioners have the chance to take their work to the U.S, available to postgraduate students, PhD researchers, academics, postdocs, and professionals. Awardees will receive funding for full tuition/visiting researcher expenses at a U.S. institution of their choice, as well as travel and living costs. Applications close 15 July 2019. A newly commissioned white paper reports the economic burden associated with neurological, mental health and substance use disorders in Australia. The report, commissioned by Mindgardens Neuroscience Network, identifies the health cost in disability-adjusted life years of brain disorders has increased by 13.5 per cent in Australia since 2010. The report is available to download via their website. Survival rates for most types of cancer are improving, according to a report released on 21 March by the Australian Institute of Health and Welfare. The report shows the number of new cases of cancer diagnosed in 2019 is expected to be three times that of 1982—rising from 47,500 to 145,000. The theme for the 2019 Forum, Shining a light on the impact of dementia research, will examine how best to maximise the impact and benefit of dementia research to the whole community – for people living with dementia, their families and carers, and those at risk of dementia – through accelerated research translation. Earlybird registrations close Friday 26 April 2019. This biennial forum hosted by the Heart Foundation will bring together health professionals from a wide range of disciplines to try and improve heart health outcomes for women. The Australian British Health Catalyst (ABHC) is designed to facilitate and promote the exchange of ideas and experience in healthcare in Australia and the UK. With a focus on integrated healthcare in a digital world, participants will be healthcare leaders in Government, technology and research experts, public health administrators, private health executives, academics and innovators. You can download the programme from their website. Plenary speakers, program themes and abstract submission dates now available on the website. Conference flyer also available to download. The Australian Clinical Trials Alliance have released their Program of Australian and International experts. Key dates – Abstract submission closes 24 June 2019, Early bird registration closes 31 July 2019. Over the next four years, APR.Intern will undergo a national expansion placing 1,400 new research internships into industry from 2017 to 2020 in collaboration with 19 universities nationwide. A new Australian Government rebate of 50% on the cost of a typical five month PhD internship of $26k, is now available to all small-to-medium and large enterprise, as well as government agencies, exclusively through the APR.Intern program. The first full round of Block Internships is planned to open for applications later this year.